Memes that Triple Your Results"
It's Your Secret Weapon for Tripling Your Social Media Results! Listen, let's face it. There's a big problem with most webinars. 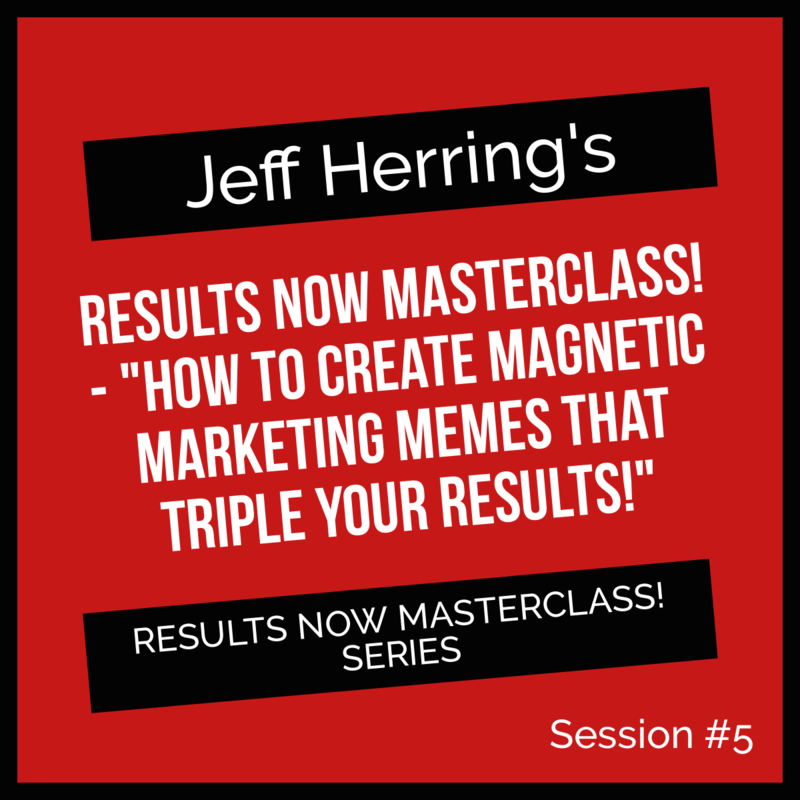 By the end of this Results Now MasterClass!, you will have created your first Magnetic Marketing Meme and then PUBLISHED IT! If you have any questions, I'm here to answer them, and coach and guide you to the result you want. When the MasterClass is over, you'll have the result. And consider this: the more Results Now MasterClasses you attend, the more results you're going to get! Here is what you're getting in this Brand New Results Now MasterClass! "How to Create Magnetic Marketing Memes to Triple Your Results!" 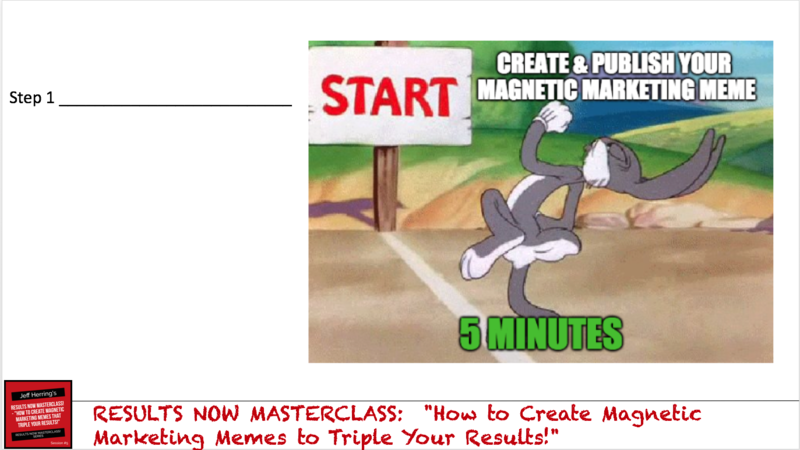 Results Now #13: Create & Publish Your First (or next) Magnetic Marketing Meme DURING the MasterClass!! "In every session Jeff, you have us create something right in the session that we can use as soon as the training ends!" On the MasterClass! you'll create and PUBLISH your first (or next) Magnetic Marketing Meme that will triple your results. But that's not all. I'll then show you how you can 10x your results with a special "mini-wizard." You'll have a marketing asset you can use right away! The LIVE Training is this Sunday Night, August 19th, at 8 pm Eastern! => Get the entire MasterClass Training for only $37 – regular price $97 – save $60! => Get your questions answered LIVE! And of course you’ll have lifetime access to the video training recordings! 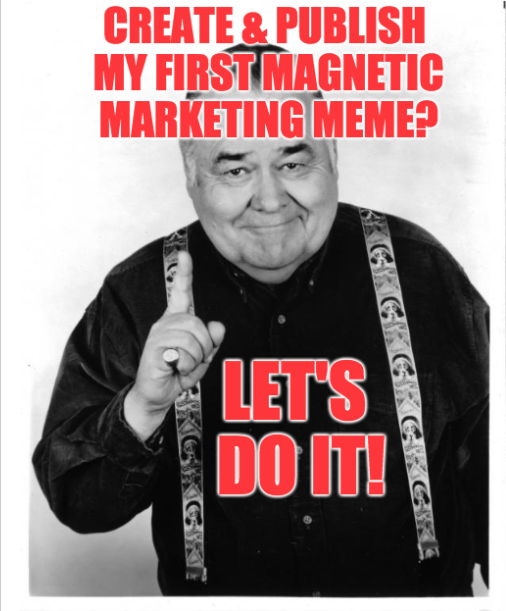 Fill in the blanks on Magnetic Marketing Memes Template to create as many sales and subscribers as you want! Join an international cast of the most generous, creative, and helpful online entrepreneurs on the planet, and get your questions answered, examples reviewed with suggestions, and all the latest updates! BIG EXTRA BONUS - The MasterClass! Magnetic Marketing Meme Mini-Wizard! Only for the first 100 BackStage Passes! Some of us learn and implement better with text – if that’s you, then the MasterClass! Ebook is for you! If The Profitable Answer MasterClass doesn’t show me exactly how to profitably answer the “What do you do?” question… if it doesn’t take me by the hand, step-by-step to quickly and easily get more customers… or if it fails to help me get more subscribers, then I understand that I will receive a full refund, No Questions Asked!